The Huffington Post's Maya Rupert explains why Rep. Barney Frank's use of the term was entirely inappropriate. 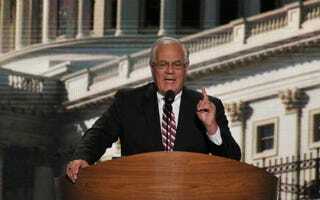 The backlash from Barney Frank's recent comment comparing the Log Cabin Republicans, a group of gay and lesbian Republicans, to "Uncle Toms" at the Democratic National Convention prompted him to take to The Huffington Post to publish an explanation of his decision to use that term. It began with an admission that he was "not surprised that members of the Log Cabin Republicans [were] offended" by the comparison. The problem is Log Cabin Republicans aren't the only ones Frank offended with this insensitive comparison. "Uncle Tom" is a racially loaded slavery reference, and his decision to use it here was entirely inappropriate. "Uncle Tom" is a pejorative epithet derived from the lead character in abolitionist Harriet Beecher Stowe's novel Uncle Tom's Cabin. Uncle Tom was a slave whose innate goodness and genuine kindness, despite being subjected to the brutalities of slavery, made him a sympathetic figure for many white audiences who had never before identified with a black character. This portrayal is credited with having humanized black slaves to many white readers and helped to foment emerging anti-slavery sentiment. Read Maya Rupert's entire piece at the Huffington Post.